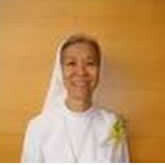 Hi, I'm Sister Rosalia Yeo, and I celebrated my 50th anniversary of Religious life in September 2010. I joined as a Postulant in 1960, when I was just 18 years old. So now you can guess my age! If you’re reading this, and you are in your twenties, I can be your grandmother. If you’re in your thirties, or even forties, I can be your mother. I don’t suppose anyone in their fifties would be thinking of becoming a nun! Well, the years have flown by , but I am still young at heart, and very grateful to God for the call to follow Him as a Canossian Daughter of Charity. I was with the Canossians all my school life: kindergarten, Primary and Secondary. When I was in Secondary One, a young missionary Sister who was passing through Singapore for Hong Kong gave us a Catechism lesson. She asked the class who wanted to be a nun. I had never thought of it before, but at that moment I just put up my hand quickly, then brought it down again because I didn’t want my friends to know. But she saw it and must have told the other nuns because after that, a few of them would drop hints now and then, but I always pretended that I had never thought of such a thing. The thought didn’t come back till I was in Secondary Three, during a year-end retreat conducted by the Sisters. One of the Sisters spoke about vocation and following God’s call. Those were the days when fear of God was more loudly proclaimed that love of God. Sister said that if we didn’t follow God’s call life would be difficult. In fact, we might even lose our souls! Wow! That scared me all right! I was so disturbed, I went to speak to the retreat Master, a kind, elderly Jesuit priest. His advice put me in peace. He told me that I still had a year of studies, and so, to keep open and praying, and to concentrate in my studies first. I didn’t say a word of this to my friends or the Sisters, but I felt I needed to tell it to my mother. It was difficult to say it to her. I still remember the day I followed her all round the house- to the kitchen, to the bedroom, to the living-room, but I just couldn’t get the words out. Finally as she was at the sewing machine, and I was seated beside her watching her sewing, I blurted out, “Mom, I want to be a nun.” Silence … then she replied, “Well if God wants you to follow him, then we won’t stop you …” I was so relieved! In my family, there are no secrets. When my father came home from work, she told him and though my grandparents were not living with us, they soon got to hear about it. My father wanted me to be a teacher first as I was still young; my grandmother was worried whether I would be able to adapt to life in the Convent, especially the food! Anyway since I still had a year of schooling, the matter was dropped for the time-being. Our attention was also taken up by the shocking and sad discovery that my sister, Barbara had leukaemia. It was a painful, worrying year for the whole family. Barbara died the following year just before my GCE exams. My father decided he would not stop me if I still wanted to pursue my vocation. He and my mother actually did all the arrangements for me with the Sisters. When I left to become a Postulant, we were eight in the family: my parents and six children: myself (eldest), Christina, Anthony, Susan, Edward, Dominic. With so many children, my parents could have insisted I wait to help them financially, but they didn’t. I realize the sacrifice they made, and I am very grateful to them for their faith and courage. They are still alive, and well enough for their age; mom is 86 and dad is 88. It was such a joy for me to have them present for my golden jubilee celebrations. My Sister Christina is also a Canossian Sister. After I left for the Convent, my parents had four more children, so we are altogether ten siblings. Convent life was tough for me. I was used to doing things at my own time. Convent life was organized throughout the day. We followed a time-table for everything. Many a time, I wished to leave. But I felt sure that God had called me. So I decided that I would remain. However, should the nuns tell me to go, I would not be responsible any more for not following the call, and so I won’t have to worry about ‘losing my soul’. That’s how my thinking went then! But no one asked me to leave. I smile when I think of how naïve I was, and how little I understood the value of a religious vocation and the gift God was offering me! Happily, as the years went by, I grew in my relationship with God and experienced His profound love and the preciousness of my call to be a Canossian Daughter of Charity. And today, I can truthfully, joyfully say that I have no regrets joining at an early age. If I had planned my life it would not have been so fulfilling.